Workers on board a ship sort out fish at a Muara Baru fishing port in Jakarta, Indonesia, Jan.13, 2016. The number of fish caught globally is drastically underreported by about 30 percent according to a study by the Sea Around Us. The number of fish caught globally is drastically underreported by about 30 percent – an error that has significant ramifications for the environment and maritime nations, according to a long-term study released Tuesday. The new estimate, in Nature Communications, puts the annual global catch at roughly 109 million metric tons – 32 million higher than what countries have been reporting annually, obscuring an “ominous decline” in seafood resources. Countries report to the United Nations Food and Agriculture Organization (FAO) their industrial catches, but not those by artisanal, recreational and subsistence fishers. But even the available commercial data is misleading. “For example, shrimp trawlers retain only the shrimp and the fish that they catch – often eight to ten times the shrimp – gets thrown away,” said University of British Columbia (UBC-Canada) fisheries professor Daniel Pauly, a lead author of the study and principal investigator of the Sea Around Us. Researchers say inaccurate data also handicaps implementation of effective fisheries policy and management measures. The study, involving 400 researchers around the world, led by the Sea Around Us, research initiative at UBC, also revealed some surprises. 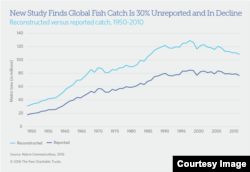 "This groundbreaking study confirms that we are taking far more fish from our oceans than the official data suggest," said Joshua Reichert, executive vice president and head of environment initiatives for The Pew Charitable Trusts. Pew began supporting the UBC study in 1994 and Vulcan Inc. jointed the collaboration with the Sea Around Us in 2014 to provide African and Asian countries with more accurate fisheries data. Data from the study broken down by species, regions and countries is being made available online at: ​http://www.seaaroundus.org/.